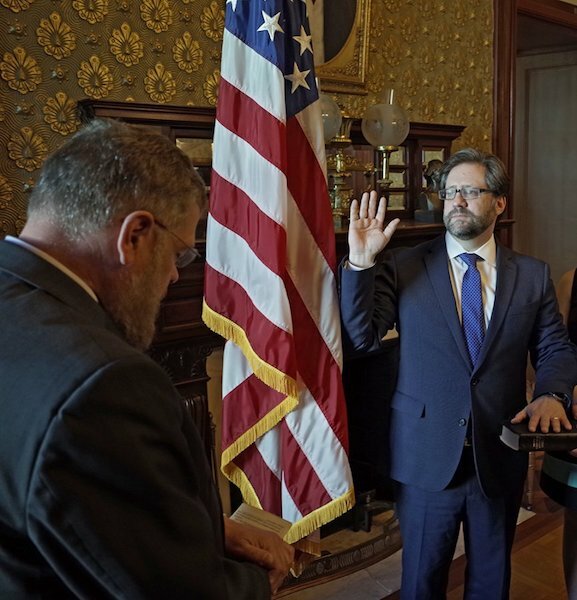 Jon Parrish Peede (MA Southern Studies ’93) was sworn in today as the 11th chair of the National Endowment for the Humanities (NEH) at a ceremony at the White House. Peede joined NEH in April 2017 and most recently served as the agency’s senior deputy chair. Under his leadership NEH has created a new category of grants to support infrastructure and capacity-building at humanities institutions, issued emergency grants for cultural organizations affected by Hurricanes Harvey, Irma, and Maria, expanded its grant offerings for museum exhibitions, and formed new partnerships with Blue Star Families and the First Nations Development Institute for reading and discussion initiatives for military families and the revitalization of Native American languages. Peede’s previous positions include publisher of the Virginia Quarterly Review at the University of Virginia, literature grants director at the National Endowment for the Arts, counselor to NEA Chair Dana Gioia, director of the NEA Operation Homecoming: Writing the Wartime Experience program, director of the NEA Big Read program, director of Communications at Millsaps College, and editor at Mercer University Press. He is the coeditor of Inside the Church of Flannery O’Connor: Sacrament, Sacramental, and the Sacred in Her Fiction (Mercer, 2007) and editor of a bilingual anthology of contemporary American fiction (Lo que cuenta el vecino: cuentos contemporáneos de los Estados Unidos [UNUM: Mexico City, 2008].) He has published widely in newspapers, magazines, academic journals, books, and encyclopedias. As a speechwriter, he has written for a U.S. President, First Lady, and Librarian of Congress.